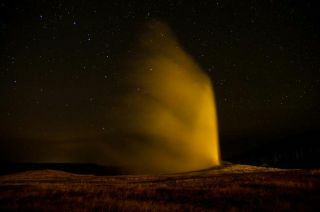 The Big Dipper can be seen low on the horizon behind Yellowstone National Park's famous Old Faithful geyser in this photo, which was taken in September 2012 by astrophotographer Dave Renwald. Step outside and look skyward this week during the late evening hours, around 11 p.m. What's the most prominent star pattern you see? The answer for most Northern Hemisphere residents is the famous Big Dipper, a group of seven bright stars easily visible in the northern part of the sky. At and above the latitude of New York City (41 degrees north), the Big Dipper never goes below the horizon. It is one of the most recognizable patterns in the sky and thus one of the easiest for novice skywatchers to find. Many stargazers use the Big Dipper to locate Polaris, the North Star. This is made possible by the two bright stars, Dubhe and Merak, that mark the outer edge of the Dipper's bowl. Just draw a line, in your imagination, between these two "pointer" stars, and prolong the line about five times. The line will ultimately hit a moderately bright star — Polaris. Long ago, when the forms of animals, mythical beasts, men and women were pictured in the night sky, a huge bear was depicted in this particular region — a bear with an impossibly long tail (because the Dipper has a long handle). The far northern region where this starry figure wheels high in the sky came to be known as the Arctic — the abode of Arktos, a Greek word for "bear." The famous Southern Cross constellation is composed of four main stars: Acrux (Alpha Crucis), at bottom; Becrux (Beta Crucis), at left; Gacrux (Gamma Crucis), at top; and Delta Crucis, at right. People who live in the Southern Hemisphere do not choose the Big Dipper as their guide to the night sky. Rather, they pick the constellation known as Crux, the Southern Cross. Those south of the equator (where the season is currently autumn) need only cast a glance toward the south, where they'll see the distinctive shape of the Cross hanging well up in the sky. To some people, it looks more like a kite, though the Cross is clearly outlined by four bright stars, two of which — Acrux and Becrux — are bright, first-magnitude stars. From top to bottom, Crux measures just 6 degrees — only a little taller than the distance between the Pointer stars of the Big Dipper. (Reminder: Your fist held at arm's length is about 10 degrees wide.) In fact, the Southern Cross is the smallest (in area) of all the constellations. Like the Big Dipper, the Southern Cross indicates the location of the pole and, as such, has long been used by navigators. The longer bar of the Cross points almost exactly toward the south pole of the sky, which some aviators and navigators have dubbed the "south polar pit" because it is not marked by any bright star. It is thought that Italian explorer Amerigo Vespucci was the first of the European voyagers to see the "Four Stars," as Vespucci called Crux, during a 1501 expedition to South America. But Crux was also plainly visible everywhere in the United States some 5,000 years ago, as well as in ancient Greece and Babylonia. Immediately to the south and east of the Cross is a pear-shaped, inky spot, about as large as the Cross itself, that looks like a great black hole in the midst of the Milky Way. It is said that, when English astronomer John Herschel first saw this dark patch from South Africa's Cape of Good Hope in 1835, he wrote to his aunt Caroline about this "hole in the sky." Indeed, few stars can be seen within this hole, and it soon became popularly known as the "Coalsack." The Coalsack was initially thought to be some sort of window into outer space, but today, we know that it's really a great cloud of gas and dust that absorbs the light of the stars beyond it. There are likely a number of readers who have never seen either the Big Dipper or the Southern Cross and might wonder how far they have to travel to get a view of them. Coincidentally, at this time of the year, both star patterns are attaining their highest positions in the sky at the same time — during the late evening hours, about an hour or two before midnight. In order to see Crux, one must go at least as far south as 25 degrees north latitude. In the continental United States, that means heading to the Florida Keys (where you'll see Crux just lifting fully above the southern horizon) or the southern tip of Texas, around Brownsville. To see the Big Dipper in its entirety, you must go north of 25 degrees south latitude. Across the northern half of Australia, for instance, you can now just see the upside-down Dipper virtually scraping the northern horizon soon after sundown. This is just the opposite effect as that seen by people in north temperate latitudes (like New York) in late November or early December, to whom the Dipper appears at a similar altitude above the northern horizon — except, to these northerners, the Dipper appears right side up! De gustibus non est disputandumis a Latin maxim meaning, "In matters of taste, there can be no disputes." The implication is that everyone's personal preferences are merely subjective opinions that cannot be right or wrong, so arguing about them is pointless. This maxim holds when trying to make aesthetic comparisons between the Big Dipper and the Southern Cross. I have seen the Big Dipper all of my life and the Cross on only a few occasions. To me, the Dipper is a more majestic star pattern, even though the much smaller Cross is brighter. Of course, someone who lives far south of the equator — in Sydney, Melbourne or Cape Town, for example — likely holds the opposite view. Perhaps a person who lives in the tropics, where both star patterns are visible during the course of the year, would be most qualified to answer the question. Wherever you live, however, you'd likely admit that both famous star patterns are striking in their own way. Editor's note: If you have an amazing skywatching photo you'd like to share with Space.com and our news partners for a possible story or image gallery, please contact managing editor Tariq Malik at spacephotos@space.com.